1. It's sunny in Alaska. 2. I haven't been cooking. 3. I'm still processing everything from China and Cambodia. As such, I give you this photo. 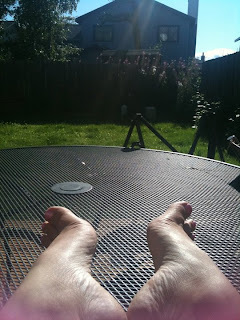 This is me last night, enjoying the sun, looking past my feet at the grass that was dying to be cut after so much rain and growth. I got up and cut the grass. My feet turned green. Then I returned to my post. Sadly, there's not an after picture of said green feet. Oh well! Inspire me - I have a fridge full of veggies that I look at with hungry eyes before I sigh and grab the broccoli florets (again) to dip in this yummy Jalapeno flavored Greek yogurt I've been finding at Costco. That pretty much sums it up! 33. EASY Buffalo Chicken Dip!! 39. Football is Finally Here Baby! !